Over the past several months, I've acquired some vacuum tubes with 12 pins on the bottom. Does anyone have any idea where I can get 12-pin sockets for these tubes? I've looked at various places on the Internet, but didn't find much to choose from. 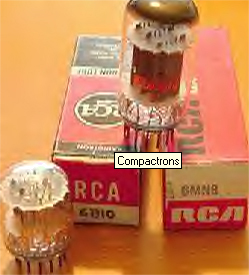 What you have is called a compactron, a stop-gap method for prolonging the life of the vanishing vacuum tube. Essentially, they placed three tubes in one envelope to reduce board space and inventory. Tube World at 920-208-0353; www.tubeworld.com has a good inventory of odd tube sockets, including the 12-pin compactron type.